From a cereal giant pouring out what should be a quarter of solid earnings growth to another food giant justifying a recent push into the $21 billion pet food and snacks business, here are some of the things that will help shape the week that lies ahead on Wall Street. The new trading week kicks off with the 2015 Goldman Sachs Technology and Internet Conference. From Monday through Thursday, dozens of technology companies will make presentations in San Francisco for the annual conference. You don't need to fly out to California to partake in the conference. Goldman Sachs and the tech companies will be making the presentations available as live webcasts that will be accessible from the investor relations websites of the individual companies. It should be interesting, especially for investors in those companies that have yet to report fresh financials this season: They often announce preliminary quarterly results so they can discuss things freely during the conference. Hospitality giant Wyndham Worldwide (WYN) reports quarterly results on Tuesday morning. Wyndham watches over 7,600 franchised hotels containing more than 655,000 rooms. It also offers timeshare properties and rental exchanges. Consolidation has been a big driver for this highly fragmented industry, and just last week we saw Wyndham announce that it would be acquiring Dolce Hotels and Resorts. The move will add two dozen properties to its growing portfolio. Whole Foods Market (WFM) reports on Wednesday afternoon. The leading organic grocer has seen traffic at its stores move higher since the economy began improving a couple of years ago, but the real challenge now is margins. Competition is starting to intensify as traditional grocers and retailers begin stocking up on organic products. Analysts see Whole Foods Market growing its sales by 10 percent, with earnings climbing at a slower pace. We'll be able to check into a cereal serial on Thursday morning when Kellogg (K) reports quarterly results. From Frosted Flakes cereal to Eggo waffles, Kellogg has breakfast covered as the world's largest cereal company. Thanks to Keebler, Cheez-It,and other familiar brands, it also happens to be the second-largest producer of cookies and crackers. There's never a dull moment at Kellogg. It introduced a peanut butter and jelly Pop-Tart last month. It acquired Pringles three years ago. Analysts see revenue climbing 4 percent at Kellogg. They also see a profit of 93 cents a share for the quarter, up nicely from the 83 cents a share it poured into a bowl a year earlier. That may seem like a big jump in earnings, but Kellogg has actually exceeded Wall Street expectations in three of the past four quarters. Speaking of peanut butter and jelly, J.M. Smucker (SJM) reports on Friday. The company behind Jif peanut butter and Smucker's jelly also owns more than a dozen other brands, including Folgers, Pillsbury and Hungry Jack. Smucker is always on the move, and last week it entered the pet food market in a $5.8 billion deal for Big Heart Pet Brands, the industry giant behind Meow Mix cat food and Milk-Bone dog treats. 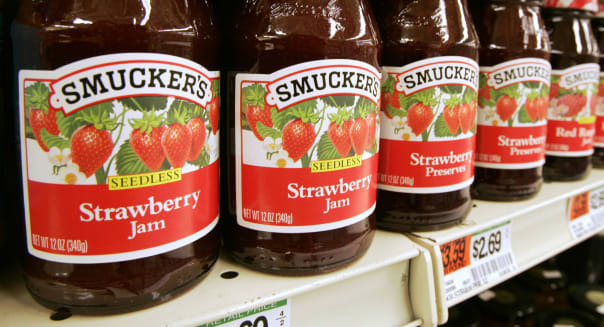 That's a significant move even for a company as big as Smucker. It will likely discuss the deal during Friday morning's conference call.